As any parent of a toddler knows, snacks are life! Truly lifesavers. I don’t leave the house without them and you best bet I take more care in packing Milly’s snacks for a trip than I do her clothes! If you think your husband/boyfriend/significant other gets HANGRY when they don’t eat, try being around a toddler when they want food. It’s not pretty. Save yourself from your sweet LO getting upset and/or maybe having a full on meltdown by always having your diaper bag/purse/car/stroller stocked with snacks for little fingers. And as much as I enjoy making homemade snacks for Milly, these are my go to store bought snacks we buy regularly and highly recommend. This post is not sponsored but even if it was-please always remember I only work with companies I use and love. You can scroll down for the full shopping list or keep reading to hear why I love each one of these snacks. I keep bowls of these Sunkist Delite® mandarins on hand. They are so juicy and delicious. They end up in my purse, the diaper bag, stroller and our car cup holders. They are always a win and Milly loves peeling them herself. This is one of those snacks I keep a few of with me cause one is just never enough! Plus these little citrus gems pack a nutritious punch. At the end of the day, those popular puffs treat containers are bulky and are really just cereal in my opinion. I allow Milly to pick out her own cereal and then pour it into her snack cups for on the go crunchies. I don’t know what it is about little cereal with holes in it that makes kiddos lose their mind but Milly enjoys Trader Joe’s Strawberry Yogurt O’s . Many of these snacks are ones I enjoy too just to be honest. And these Tillamook Sharp White Cheddar slices are so good for a little afternoon pick me up. Add a few crackers in your purse and some fruit and it’s a make-your-own cheeseboard. Haha! These are individually wrapped which make it so convenient to just grab and go and each slice has 5g of protein! This next treat should get its own post because Happy Baby Organic Yogis Freeze-Dried Yogurt & Fruit Snacks make Milly do whatever I need her to do. It’s like a dog to a bone! If she’s squirming when I’m trying to put her in her carseat, if she’s losing patience in the line at the post office…anytime she’s absolutely “over it” I take a little Yogi out and she’s all smiles. I only use these for those necessary moments so these are not for snacking but my little secret mama weapon. I think if I ever let her snack on them they’d lose their power so they live in a special container in my purse and car and I always make sure I’m never out. The first time I discovered these Once Upon a Farm Fruit and Veggie Blends we were at the grocery store and I let Milly pick one out to snack on while we shopped. Her favorite flavor is Peter Banana Pumpkin Eater. All organic with 3 grams of protein and 3 grams of fiber, they’re like cold pressed smoothies for kids. I also put them in her whole milk yogurt popsicles. Just like her father, Milly loves peanut butter. I keep these Lance Whole Grain Wheat Peanut Butter Cracker Sandwiches around for both of them, really! She usually only eats two at a time so it takes a while to go through 1 pack but they’re always a sure thing with her. These are classic cracker sandwiches made with whole wheat flour. Another whole wheat flour snack we like are Annie’s Organic Cheddar Bunnies. We purchase a lot of Annie’s Organic products including their macaroni and cheese and graham crackers. I prefer to buy the big box and portion it out myself and sometimes I’ll make my own snack mix with a few of these other dry treats for a little something different. Great for grab and go with no work are Blueberries. If you follow me on Instagram you know that this is Milly’s favorite! Available year round, I buy these by the box full. I especially like bringing these when we go out to eat incase the food takes too long I know Milly will enjoy some bluebs without spoiling her appetite. When she was teething I liked keeping them in the freezer for relief from those swollen gums. They’re also great to add into her oatmeal and smoothies. Speaking of oatmeal, Milly just got on an oatmeal kick so especially for an on the go snack, I like Quaker Real Medleys Oatmeal Cups. Just add hot water and you’re set. I add fruit for extra yumminess too. This oatmeal is sweet enough for it to feel like dessert and it’s been a good in between meal for when our schedules are wonky. It’s also a great food to practice self-feeding and using a spoon. We don’t buy that many snack packs but these Mama Chia Squeeze are a fun little find I spotted by the applesauce. High in omega 3’s, protein and fiber this is also a wonderful vegan and gluten free snack. You can serve them refrigerated or room temp. Usually Milly only drinks half of a pouch so I also mix these into her yogurt popsicles and smoothies. Maybe it’s cause she’s a Cali girl but Milly loves avocados! 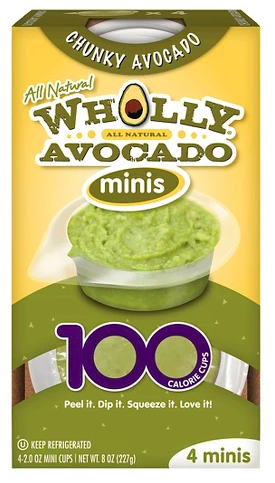 She has avocado toast at least 5 x week so it’s no surprise she loves Wholly Guacamole Classic Minis. I pack these in her lunchbox with cucumbers or crackers for dipping and she gobbles it up! Last summer when we were in NYC shooting my Food Network show, “Let’s Eat!” these Nature Valley Breakfast Biscuits with Almond Butter were in my dressing room. I brought them back to the hotel for Mr. A and Little A to have and they both immediately liked them. Slightly sweet with creamy almond butter between the granola biscuits, each pack comes with two which is perfect. We’ve been rotating them in our snack pantry ever since. I’ve talked about this a lot on Instagram but often times when I go to Starbucks to get myself a grown up drink, I will ask for a tall water with freeze dried strawberries for Milly. She only drinks water and we do not offer her juice at this time so this kid friendly pink drink makes her feel like she’s a big girl. 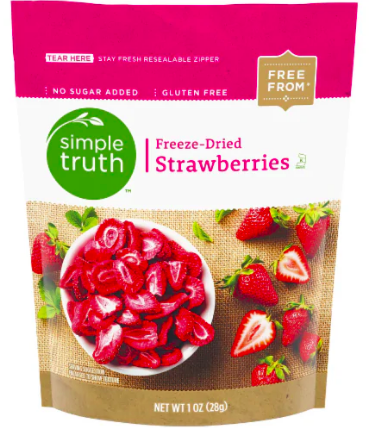 I like to have Simple Truth Freeze Dried Strawberries on hand for homemade versions or I will mix them into her snack mixes I create. Milly has never been a huge fan of cow’s milk and this is probably because she was breastfed 18 months and Mama’s milk is much sweeter than cow’s milk but we also don’t drink cow’s milk in our home. I try to use it in my cooking and baking but we also started incorporating Stonyfield Organic Whole Milk Yogurt Pouches into her snacks. Sometimes Milly isn’t into the whole pouch thing (as I mentioned already the only pouches we buy are the Once Upon a Farm and Mama Chia) so I’ll squeeze these into a smoothie or her tumbler and she’ll guzzle it down. I think there is something to be said about being able to see what she’s eating. I know you can buy Boiled Eggs already boiled and peeled but I prefer doing them myself. I’ve tried a ton of different brands and I really think they taste better when I make them. Heehee. They also don’t get that weird slime on them they get when you buy from the bags at the store. I keep my eggs unpeeled for on the go and usually bring a fun dip for them like hummus or Everything But the Bagel seasoning. I grew up eating Mini Babybel Cheese so naturally I buy them for Milly. They taste so good and they’re softer than the sharp white cheddar ones so we like to keep options on hand! Any snack that involves an activity or action is more exciting for a toddler. Justin’s Classic Almond Butter Snack Pack with Pretzels accomplishes just that. Reminds me of those dipping snacks I loved when I was a kid but these are so much better for you! I buy these for me but Little Amazing loves them too. This Bar Saves Lives are our favorite since I’m not a fan of most traditional bars or energy bars. The kid ones have been out of stock at Target lately but we will share the grown up versions. The chocolate can be a little messy and anything with chocolate is considered a treat in our home so they are for special moments only. First of all, the photo above has nothing to do with this recipe except it’s a pic of Milly holding our favorite Momofuku Milk Bar birthday cake truffles from her first birthday. I haven’t had a chance to take pics of these protein balls so there you go! Hope I didn’t trick you. Into a food processor, add nuts, dates and almond butter and process. Add fruit and process some more until mixture comes together enough to form ball. If mixture is too “wet” add more fruit and nuts by the tablespoon. If mixture is too dry, add a tablespoon of almond butter or a few dates until desired consistency. Roll into balls and place in fridge to firm up and enjoy within 10 days!